2013 Ocean Hero Awards Youth Winners! 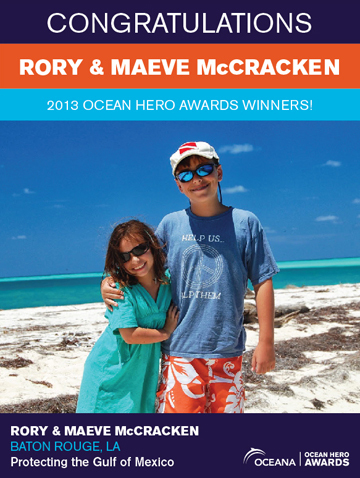 Congratulations, Rory and Maeve McCracken, our 2013 Ocean Hero Awards youth winners! When we told Rory and Maeve McCracken that they had won our 2013 Ocean Hero Awards in the Youth category, they were excited, to say the least: “I could barely breathe, I couldn’t move. I was so happy and so shocked at the same time,” ten-year-old Maeve explained. “I couldn’t really comprehend it at first. To me it’s just a huge honor to be listed with everyone else, let alone to win,” said fourteen-year-old Rory. The competition was stiff, but after 300 nominees, a dozen accomplished finalists, and weeks of voting, Rory and Maeve’ work to save the Gulf of Mexico won the day. The siblings have also published an illustrated ABC’s book, G Is for Gulf, and the pair are currently working to donate copies of G Is for Gulf to elementary school libraries and classrooms around the country. To date, books have been donated to schools in Louisiana, Florida and Honduras. The future is certainly bright for this passionate pair: This fall, Rory and Maeve will present at Louisiana State University’s “Ocean Commotion,” which brings about 3,000 area students and teachers to LSU to learn about the Gulf coast and the ocean from about dozens of presenters and exhibitors. Rory and Maeve will be hosting a presentation on sharks to elementary school students, and perhaps inspiring some budding youth Ocean Heroes in the process! The McCrackens shared their next dream project with us, as well: “Our big dream is to get a ‘Kids Love the Gulf’ reef ball somewhere off of Louisiana and grow an artificial reef.” With an engineer for a father, Rory and Maeve’s dream just might become a reality. So what advice do these inspiring Ocean Heroes have for young ocean lovers who want to make a difference? “I want people to know that kids can make a difference too. Kids of all ages can do what they believe in,” said Maeve. “Once you set your mind to do something, you’re going to be able to do it if you try. If you try long enough, and hard enough, you can do anything,”Rory urged. The McCrackens’ story and their victories have us convinced. We’ll be expecting G Is for Gulf in every classroom across the country, and we’ll be looking out for that reef ball in the waters off of Louisiana soon! Congratulations, Rory and Maeve!